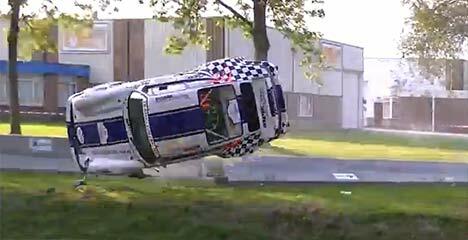 Here’s a pretty spectacular accident involving a Porsche 964 RSR, a barrier and a river. Harry Kleinjan was taking part in this year’s Hellendoorn Rally, when he appeared to go straight on rather than negotiate a right-hand bend. We can see his brakes locking up ahead of the impact, which also ripped both driver’s side wheels off, so it may be a case of ill-judged late braking, locking brakes or a jammed throttle. Whatever the reason, we’re glad to say that Harry and his co-driver Bart den Hartog were unharmed following their flight.